The printing business has evolved in many ways. During the last many decades, technology has changed the way that pages are prepared for printing from the days of setting type by hand to computerized page setup. Printing presses were first powered by hand, then by electric motors, and have now become sophisticated machines with pneumatic actuators, electronic controls, and data collection devices to monitor the entire process. What has not really changed very much is that the printing business remains very competitive. That competition used to be a local affair, where neighborhood print shops would vie for printing the advertising brochures, instruction manuals, or other printed material for the local businesses. Even newspapers had much more local focus. Printing companies could differentiate themselves from their competitors by trying to run a more efficient operation, or obtaining more advanced equipment, or purchasing their paper and ink supplies more economically. They needed to make sure that they prepared the correct amount of ink for the job that was being run. If too much was prepared, it was likely that they would not have another job that needed the exact same material. If too little was formulated, they would have to stop the press, or use extra labor to prepare a new batch. Competition later became a nation wide situation. Businesses could now choose printing organizations from anywhere in the country. There were now trade offs involved in choosing a firm in an area where labor might be less expensive, but transportation charges for the completed printed material might add additional costs. What remained constant is that those printing companies that operated in an efficient manner were more likely to be successful in attracting business and remaining profitable. Again, preparing the printing supplies and monitoring their usage were key to achieving this. Today, the global economy has offered broader opportunity and of course, broader competition. The Internet has made it easy to conduct business in different time zones, different countries and different languages. Depending on the type of printing job, the cost of labor may be the most important attribute in achieving the lowest cost product. Or it may be access to the best sources of paper or ink products. For larger jobs, it is likely to also be those printing firms which utilize the most modern, advanced printing equipment which helps the firm monitor their production lines to achieve the greatest efficiency. 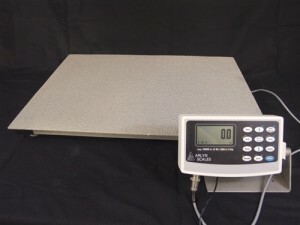 Industrial weighing scales play a key role in maintaining a highly efficient printing operation. One of the most useful methods is to monitor the use of the inks, varnishes and other materials used during printing. Typically, the electronic scale is placed under the tank of liquid material. As the material in the tank is used, the scale can accurately determine the overall usage, and in some cases the actual rate of consumption. The scale may only have the assignment of providing an alarm when the tank is almost empty. Or it may include data logging capability in order to analyze the usage at a later date. Or it could have a live data connection to a central location for real time data collection and control. The most important feature of the digital scale is its accuracy. 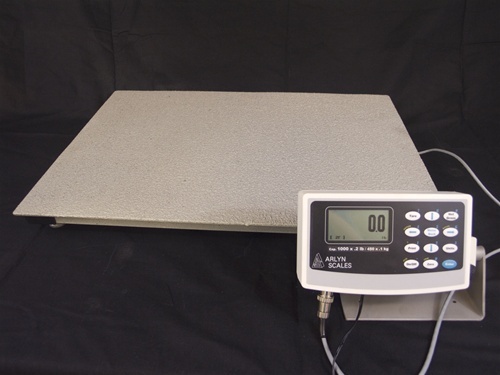 High quality industrial scales, such as the Arlyn Platform Scales have an inherent accuracy of 1/10 of 1%. This is generally more than adequate for purposes of determining the amount of material being used. Furthermore, these scales incorporate stainless steel load sensors, allowing them to absorb the large shock loads that may occur when a full tank is being placed on the scale platform. It also avoids corrosion on the sensors, resulting in longer, trouble free scale life. Yet another feature of the platform scale is the very low profile, where the top of the platform is only 1 7/8 off the ground. This becomes important when a new tank is placed on the scale, or an empty tank is removed. If it would be useful to know the actual rate of usage, determined in real time, an ultra precision scales, such as the Arlyn Surface Acoustic Wave scales should be used. These SAW scales have twenty times better accuracy than standard industrial scales. This provides good view of the usage of even very small amounts of material. It is no longer necessary to wait for an hour or more to accurately calculate the material consumption. Instead, the usage may be seen during just a few minutes of printing press operation. The control system can use this information to help determine that the press is working properly.